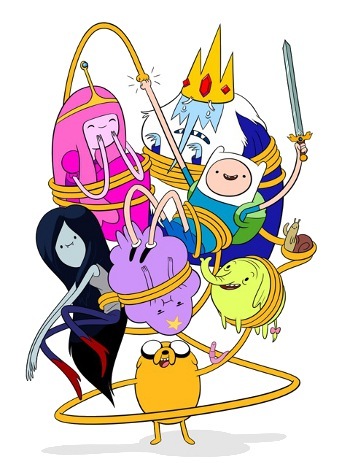 Adventure Time (aka Adventure Time with Finn and Jake) started as a seven-minute short created by Pendleton Ward. Originally produced to be a part of "Random! Cartoons" on Nickelodeon, it was meant to premiere in Fall of 2007. The animated variety show was delayed until December 2008, but the short was previewed in 2006. As is the way of things, the previewed short was leaked unto the Internet and quickly went viral. Both the series and original short features the adventures of two best friends: Jake the Dog and Finn the Human. Their adventures are nonsensical, crazy, and bear more resemblance to a group of kids playing with action figures than a coherent story... which is probably why it's so much dang fun. Nickelodeon passed on making it into a series, but Nickelodeon's rival Cartoon Network saw the potential in this and ordered two full seasons before the show even aired. It started airing on the television screen on April 5, 2010 to the delight of 2 million viewers. As of now the show is currently in its fourth season and writing for the fifth has already begun, and life is good. A comic book adaptation written by Ryan North is published by Boom Studios. Did we mention the creator also storyboarded on The Marvelous Misadventures of Flapjack? You can actually see his unique "oomph" in the episodes he storyboards, where there are jointless limbs, cute/scary faces and figures, and a very loose style compared to the other artists. The creator of Flapjack is in turn a writer and producer on Adventure Time, and even voiced a wood witch. The mathematical production blog, which also features art from fans, is located here. Tropes for the comic book go here. This page was last edited on 25 March 2017, at 15:41.